I try to write reviews more now that I blog, but the truth is, I have always despised writing them. For some reason, I struggle with getting around "I hated it/I loved it". However, I still challenge myself to write them because 1) it makes me think about the book more and 2) I think it makes me a better writer. When I'm judging a book I always consider three things. Did it have an effect on me? I recently finished Perks of Being a Wallflower. To be totally honest, I didn't really like it. I didn't enjoy reading it because it made me uneasy. I was genuinely concerned for the main character and I was frustrated with the turn of events. So, after reading it, I sat down to write my review. I started to rattle out a list of reasons why I thought it deserved 3 stars rather than 5, but I just kept getting stuck. 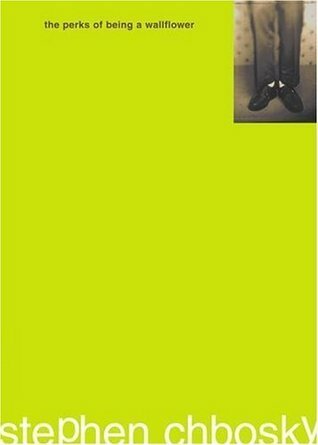 Because even though I didn't enjoy it, I still think it is a good book. For a long time, I couldn't stop thinking about it. I was passionately angry. I wanted to talk to people about it. So really, who cares if I could list 20 things about it that I didn't like. Is that really helping anyone? Obviously, a bunch of people loved it, and it clearly effected me in a major way, so who am I to say it didn't do exactly what the author intended? Just because the story didn't go as I wanted doesn't mean it was a bad story. That's life, right? I read plenty of books in my time that are incredibly entertaining but are certainly no Hemingway, so how do I rate those? And I know there are a few people out there who actually enjoy reading Austen, but even I can admit that those books are very well written without being titillatingly entertaining. So basically, what I'm trying to say is that there are many different ways to decipher how good or bad a book is. One thing that drives me totally nuts is when I read a review on Goodreads and I can tell that the reviewer clearly thinks he or she are smarter than the author, so they write this incredibly clever review knocking absolutely everything about the book thus making them look superior in every way. Usually these reviews are shallow and pointless. Also, it drives me nuts when someone judges a book based on something it's not. If you're a Harvard English Professor, I don't care much for your in-depth critique on Twilight or Fifty Shades of Grey. It really wasn't written for you anymore than Perks was written for me. I can't stand when non-YA people talk down to YA readers and I equally hate when non-Classical readers bash the Classics. So I guess what I'm trying to say is that I really appreciate book reviews that offer the reader a fair and considerate idea about the book they are reviewing. If you don't like it, that's one thing, but if you think it's not worth reading at all, tell us why. I like when people recommend books based on similar favorites. 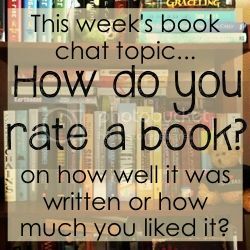 Do you judge a book based on how much enjoyed reading it or how well it was written? Can you appreciate a book that angered you or upset you? What do you like to see in a book review? You can answer in the comments, but if you wish, you could blog on this topic and link up here! Book reviews are definitely a very personal thing, so I think that everyone (depending on their style) will rate a book differently. If Perks isn't you style, that's FINE. Just because everyone LOVESITOMG doesn't mean you have to, too! I've felt that way about books in the past too. Some of the most influential books in history and I hate them. It's all personal preference. I prefer to read YA and I associate better with it, therefore it gets better ratings from me! I really just avoid reading book reviews in general, because 95% about the revies out there (esp on Goodreads) will only list very personal reasoning around the book. "It's a bad book because I didn't like the story/the character/the setting/whatever". Well surprise, I don't care about that. If I'm reading a review it's usually because I'm considering reading the book, so I already know what it's about. I want to know if it's good or bad literature, not what readers think personally about the story because we all like different things based on life experience and whatever. I've found that a lot of people are book snobs though, especially people who read classics. Doesn't matter if I've read 50 books they've never heard of, the fact that I haven't read Pride and Prejudice is the biggest crime known to man and I can't call myself a book lover because of it. It's ridiculous, really..
You should!! I'd love to see it if you do. i agree with you tremendously here. P.S. - I love your photo headline at the beginning. It's so clean! I don't know if I want to see the movie. I did see the previews and it looks good but some of that book was so painful for some reason to me, that I don't know if I want to endure it again.